THE STORY - Loung Ung is 5 years old when the Khmer Rouge assumes power over Cambodia in 1975. They soon begin a four-year reign of terror and genocide in which nearly 2 million Cambodians die. Forced from her family's home in Phnom Penh, Ung is trained as a child soldier while her six siblings are sent to labor camps. THE GOOD - Sareum Srey Moch gives a natural and well-done lead performance. Angelina Jolie's passion for telling Loung Ung's story is evident. The story of the Cambodian genocide is important to tell so it isn't forgotten. THE BAD - The pacing is glacially slow in the middle of the film. The narrative doesn't have as it much impact as it should until well into act three. The cast is so large that only a couple of characters are fleshed out much. ​When the subject of genocide in the 20th century comes up, most people in the West remember the Holocaust and Hitler first, usually followed by Stalin's purges in the Soviet Union, and then maybe the Cambodia genocide under Pol Pot and the Khmer Rouge regime. Loung Ung is a woman who was a girl during the genocide, but survived to write a memoir about her experiences called “First They Killed My Father: A Daughter Of Cambodia Remembers.” Now, Angelina Jolie has made a film based on that memoir. And while I can't call it bad, I wish I could say I liked it more. Loung Ung (Sareum Srey Moch) is a little girl living with her parents and six siblings in the Cambodian capital of Phnom Penh in 1975. When the Khmer Rouge army takes the city, Loung and her family are forced to leave. Eventually, they are put into a work camp in service of the regime. As time passes, amidst the tragedy of The Killing Fields, the young girl tries to remain strong with the help of her siblings, even when separated from each other. When I first heard that Angelina Jolie was making a film for Netflix about the Cambodian genocide, I was intrigued. I didn't know much about it because it wasn't marketed at all (at least in my experience). And yet, I can tell that “First They Killed My Father” is a very personal story. We follow Loung for years of her life. We see her happy life with her family, the sadness she has when forced to leave her home, and the fear she faces when separated from her family. The passion for telling this story that Angelina Jolie brings to the table is clearly evident on screen, especially given that Loung helped Jolie write the screenplay for the film. A lot of credit must also be given to Sareum Srey Moch. She is asked to carry a film about a very heavy subject over the course of 135 minutes. And she pulls it off admirably. Her performance is very natural and she fills the character of Loung with both a tremendous fragility and, over time, a strong will to survive. Child performances can, and often do, often go off the rails because the child isn't a good enough actor to handle what he or she has been given. No such worries here. Unfortunately, “First They Killed My Father” is not without its problems. 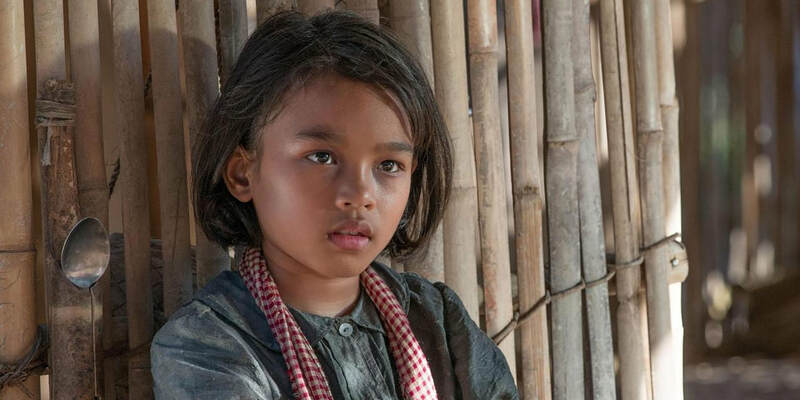 For a film about the genocide of around 2 million people (25% of the Cambodian population), I didn't feel like it left nearly as big an impact on me as it should. Primarily, I chalk this issue up to the terribly slow pacing in the second act. Several sequences are largely repetitive things that the audience has already seen. We don't need to see the indoctrination of kids or people being forced to pick vegetables over and over. I found myself checking the time and wondering how much of the film was left. Additionally, the scenes that I would describe as traumatic and impactful either take place in fever dreams or don't occur until the third act. To be sure, once we get to the third act, there are some truly horrific things that occur. People have limbs destroyed or mutilated by landmines that the children had buried in an earlier scene. Child soldiers are blown apart or catch fire from mortar shells being fired into their camp while they flee for safety. These scenes are easily the most effective in bringing the viewer into the tragedy of these events. I just wish they were more evenly spaced out in the film. “First They Killed My Father” also features an extremely large cast. Loung's family contains two adults and seven children by itself. Then, there are all of the other victims, soldiers who run the labor camps, soldiers who train the children as soldiers, and many more besides. The focus rightly stays with Loung, given that it's her story being told. However, we only really get to know her father and a couple of her siblings in any detail beyond their status as family members. And everyone else is just there because they have to be. This criticism is not as problematic, given how intimately it focuses on Loung. But, I'd have liked to have known more. In the end, “First They Killed My Father” is a decent effort at telling a deeply important story. Genocide must never be forgotten. Angelina Jolie clearly wants the world to remember the Cambodian genocide by telling Loung Ung's story. Sareum Sray Moch does an excellent job of carrying the film. But, the slow pacing in the middle of the film, the repetitive nature of some scenes, and the unevenness of presentation of the traumatic events leaves me feeling a little tepid. I still recommend it, but I can't do more than call it more than pretty good.